The World Club Challenge is here again. This time Wigan take on Sydney Roosters. The Warriors have four titles in this event, while the Roosters have won three themselves. But who are the stars to watch coming over from Australia? Will this be the last chance fans in this country get to see Cooper Cronk in action? Now 35, the veteran half-back has been included in the squad for Sunday. Even by his standards, Cronk produced a memorable performance in the Grand Final win over Melbourne Storm. He starred despite a broken bone in his shoulder, an injury normally associated with car crashes according to the club doctor, and Cronk has been passed fit for the Wigan game. The win over Melbourne was his eighth Grand Final, but seven of those were in the colours of the Storm. Cronk played his part in four successful teams there (although two were stripped for salary cap breaches), before winning the competition in his first season with the Roosters. His honours list is endless. Two World Cup wins, 22 Origin appearances, two-time Dally M Player of the Year, five-time Dally M Halfback of the Year and 2012 Clive Churchill medal winner - awarded to the man of the match in the NRL Grand Final. Cronk is yet to reveal his long-terms plans in terms of retirement, but tune in on Sunday to see one of the game's greatest in action. Leading the Roosters is Boyd Cordner. He's the club's co-captain along with Jake Friend. The 26-year-old second rower had a year to remember in 2018, skippering the Roosters to that NRL success before captaining Australia in the tests against New Zealand and Tonga in the absence of Greg Inglis. Cordner also led New South Wales to just their second Origin series win since 2005. He's got 12 Origin appearances and 19 Australia caps to his name, scoring the only try of that 2017 World Cup final against England. The 26-year-old has previous experience of facing the Warriors, playing a role in the side that won the 2014 World Club Challenge. Expect to see him leading from the front on Sunday. There's another experienced Australian international heading for England with the Roosters. But for Brett Morris, it will be his first taste of pulling on the Roosters jersey. He signed from Canterbury-Bankstown Bulldogs in the off-season, with the Roosters becoming his third NRL club. Morris is a versatile outside-back, comfortable mainly on the wing, but also at full-back, although he could play in the centres with Latrell Mitchell staying at home to represent the Indigenous All-Stars instead. The 32-year-old may be competing with Ryan Hall for a place in the side during the season, with both new wingers boasting impressive try scoring records. Morris has 146 tries in 237 NRL games and an astonishing 14 in nine games for Australia, including nine in the 2013 World Cup. A 2010 NRL winner with St George Illawarra Dragons, Morris scored twice against Wigan in the 2011 World Club Challenge. Will he repeat that feat on Sunday? It's an early return to England for one of the Roosters' front rowers. Jared Waerea-Hargreaves played all three tests in this country for New Zealand in the autumn, having impressed in the win over Australia in October. His form for his country and for the Roosters in their title winning campaign earned him the New Zealand player of the year award. That's a remarkable turnaround for a player who was dropped from his national team for three years after a disappointing 2013 World Cup. But Waerea-Hargreaves is a consistent performer for his club - a powerful front rower capable of big metres. He's the vice captain of the Roosters and the long serving prop forward on the books, having been with the club since 2010. He made 2787 metres in 2018, playing 24 times in the run to the Grand Final. 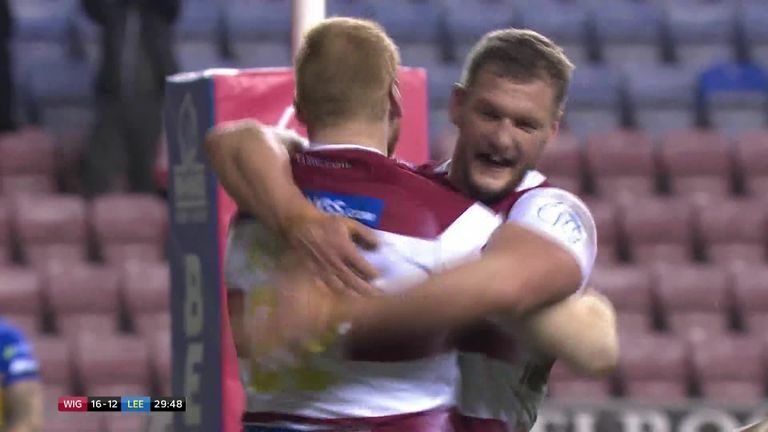 Waerea-Hargreaves was a try scorer in the 2014 World Club Challenge win over Wigan. Will the Warriors be able to handle him better this time round? There's an interesting name in the Roosters squad heading for England, and it's one that's all too familiar for Wigan's head coach because Lachlan Lam is the son of Adrian. He could make his debut for the Roosters this weekend. Like his dad, Lam is a half-back, but he's got some serious competition ahead of him. There's Cooper Cronk, an ideal player to learn from, but Cronk's regular partner is Luke Keary, the Clive Churchill medal winner in that 2018 NRL Grand Final win. "He rang me and said he’d been invited to go and I cried to be honest with you. I know he’s worked really hard in this off-season for them and I’m just pleased they’ve seen that in him and he’s got an opportunity to be a part of the squad and come." But, 20-year-old Lam is among the players heading for Wigan and Trent Robinson, the Roosters head coach, has admitted he has a chance of playing. Despite not having an NRL appearance to his name, Lam is already a Papua New Guinea international, scoring twice in a 64-0 win over the USA in the 2017 World Cup, before playing in a win over Fiji last June. Will he be allowed the chance to strut his stuff in front of his father on Sunday?